Draft: 2012, Miami Marlins, 1st rd. Andrew M. Heaney (Hee-knee)...On Twitter: @Heandog8... Annually participates in off-season mission trips to Honduras along with other Major League and Minor League players to help build a new learning center and teach baseball... Attended Putnam City HS (OK) and Oklahoma State University...Named Big 12 Conference Pitcher of the Year and Division I First-Team All-American in 2012 after leading NCAA with 140 strikeouts in 118.1 innings pitched... Played in Arizona Fall League following 2013 season, going 2-1 with a 1.95 ERA (27.2 IP - 6 ER) in seven starts for Glendale...Earned AFL Player of the Week Honors during the seasonfs fifth week... Named by Baseball America and MLB.com as Marlins top rated prospect entering 2014 season...Named as having best slider in Marlins organization by Baseball America... Rated by MLB.com as top left-handed prospect in all of Minor League Baseball entering 2014... Entered 2015 ranked as Angels #1 prospect according to Baseball America. Recipient of Nick Adenhart Pitcher of the Year Award, which is given to Angels pitcher whose performance is selected by his teammates as the most outstanding throughout the course of the regular season...Became first left-hander to win the award... Opened year on disabled list (left elbow inflammation) for second consecutive season...Made one rehab appearance with Adv.-A Inland Empire April 6 (W; 6.1 IP, 2 H, 1 ER, 1 BB, 6 SO) before making season debut with Angels April 13 at Kansas City... Set single-season career highs in nearly every pitching category, including wins, games, starts, innings pitched and strikeouts...Led Angels pitching staff in innings and strikeouts...His 180 strikeouts were the most by an Angels pitcher since C.J. 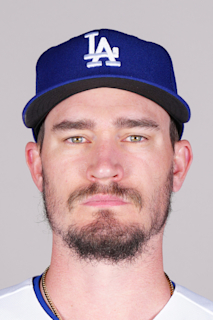 Wilson (188) in 2013... Did not allow a home run to a left-handed batter all season...His 160 left-handed batters faced without allowing a home run were most in American League and third-most in Majors...Has not allowed a home run to a lefthanded batter since April 5, 2016 (Anthony Rizzo)... Tossed one-hit shutout on June 5 (his 27th birthday) vs.Kansas City… Marked first complete game and shutout of career…First CG one-hitter for Angels since Ervin Santana on June 16, 2012 vs. Arizona…First Angels lefty with a one-hit shutout since Chuck Finley on May 26, 1989 at Boston…Became first Major Leaguer to throw a one-hit shutout on his birthday since Cardinals' Vicente Palacios on July 19, 1994 at Houston. In final 13 home starts of year, went 7-2 with a 2.65 ERA (85 IP - 25 ER)...His home ERA ranked third in American League in that span (since April 27) behind Corey Kluber (2.29) and Mike Fiers (2.46).Road victory on Aug. 30 at Houston was first since Sept. 2, 2015 at Oakland...Streak of 17 straight road starts without a win was longest in Angels history (previous was 16 by RudyMay from 1965-69)...Set single game career-high with 12 strikeouts on Sept. 9 at Chicago (A.L. )...Also recorded 10 strikeouts in consecutive starts on July 3 at Seattle and July 8 vs. Dodgers...During eight game stretch from April 27 - June 5, pitched to a 1.93 ERA (51.1 IP - 11 ER). Opened year on disabled list recovering from Tommy John surgery (July 1, 2016) ... First rehab appearance July 13 for AZL Angels marked first game action since Apr. 5, 2016 ... Made six total rehab starts between AZL Angels and Triple-A Salt Lake before returning to Angels for first start Aug. 18 at Baltimore...Missed total of 281 games on disabled list ... Recorded 10 strikeouts Aug. 28 vs. Oakland, which established a new single-game career high ... Did not walk a batt er in each of first two starts for Angels...Including final start of 2016, streak of three starts without a walk is tied for third longest streak in Angels history behind only streaks of four consecutive starts with no walks by Matt Shoemaker (May 21-June 6, 2016) and Bert Blyleven (Apr. 9-27, 1990). Made lone start of season for Angels April 5 vs. Cubs and allowed four earned runs in six innings pitched and matched career-high with seven strikeouts...Missed final 160 games of season aft er being placed on disabled list April 6 with a left fl exor muscle strain...Underwent Tommy John surgery July 1 aft er platelet-rich injecti ons and stem cell therapy were unsuccessful... Surgery was performed by Dr. Neal Elatt rache in Los Angeles. Entered year ranked as Angels No. 1 prospect according to Baseball America. Opened season with Triple-A Salt Lake, going 6-2 with a 4.71 ERA (78.1 IP - 41 ER) in 14 starts... In first nine starts with Bees, went 5-0 with a 3.02 ERA (50.2 IP - 17 ER). Promoted to Angels June 24 and made Halos debut that day vs. Houston (6 IP, 1 ER, 4 H, 1 BB, 5 SO). In 18 starts for Angels, went 6-4 with a 3.49 ERA (105.2 IP - 41 ER) and 78 strikeouts. Among American League rookies, ranked fourth in ERA, sixth in starts and batting average against (.248), eighth in innings pitched and strikeouts and ti ed for ninth in wins. Named American League Rookie of the Month for July… Went 4-0 with a 1.98 ERA and 19 strikeouts in 27.1 innings pitched over four starts. Allowed two-or-fewer runs in 13 of 18 starts. In seven starts against A.L. West opponents, was 3-1 with a 2.61 ERA (41.1 IP - 12 ER). In first six starts of season, went 5-0 with a 1.79 ERA (40.1 IP - 8 ER), 31 strikeouts and five walks. Tossed at least five innings and allowed two-or-fewer runs in each of his first seven games with Angels… Tied Jered Weaver for club record for longest such streak to start Angels career. His six consecutive team wins to start his Halos career tied Jarrod Washburn for Club record (in starts) among lefties and were one shy of Jered Weaver's overall club record. Earned first win of Major League career on June 30 vs. Yankees aft er tossing seven innings and allowing one earned run on two hits… Became first Angels lefty to have first win of big league career come against Yankees since Chuck Finley in 1986 (STATS LLC). Began season with Double-A Jacksonville, making nine appearances (eight starts) and pitching to a 4-2 record and 2.35 ERA (53.2 IP - 14 ER) before being promoted to Triple-A New Orleans May 20...Named Southern League Pitcher of the Week for April 14-20...Took the hill for four starts with New Orleans before having contracted selected by Marlins June 16...Named Marlins Minor League Pitcher of the Month for May, combining to go 3-1 with a 1.96 ERA in six games between Jacksonville and New Orleans...Made Major League debut with Miami June 19 vs. New York Mets at Marlins Park...Allowed one earned run on four hits across six innings pitched with one walk and three strikeouts...Suffered the loss in a 1-0 decision (CG shutout by Zack Wheeler), becoming 16th pitcher since 1914 to lose MLB debut in a 1-0 decision (min. 6 IP), according to STATS LLC...Optioned back to New Orleans following fourth big league start...Was 0-3 with a 6.53 ERA (20.2 IP - 15 ER) at the time with Marlins...Finished Minor League season with Zephyrs, going 5-4 with a 3.87 ERA (83.2 IP - 36 ER) with 91 strikeouts and 23 walks...Recalled by Marlins Sept. 2 following conclusion of PCL season...Held opponents scoreless over two relief outings (4.2 IP) following Sept. call-up, allowing just two hits and striking out four...Third and final appearance of season was start on Sept. 26 at Washington in second game of doubleheader...Did not factor in decision after allowing four earned runs on six hits across four innings pitched...Was traded twice in one day on Dec. 10 during MLB Winter Meetings...Was first sent by Miami to Los Angeles Dodgers along with C/IF Austin Barnes, RHP Chris Hatcher and OF Enrique Hernandez in exchange for INF Dee Gordon, RHP Dan Haren, INF Miguel Rojas and cash consideration...Later that day was dealt by Dodgers to Angels in exchange for INF Howie Kendrick. Combined to go 9-3 with 1.60 ERA (95.1 IP/17 ER) in 19 games (18 starts) between Single-A Jupiter and Double-A Jacksonville...Started campaign on disabled list with strained back and didn't make first start until May 20 at Daytona...Allowed four hits and one unearned run over 5.1 innings, striking out a season-high nine batters...First decision was loss on June 13 at Brevard County...Entered game in sixth inning in relief of Henderson Alvarez and was handed loss after giving up two runs (none earned) on two hits with two walks and four strikeouts over 3.0 innings...Marked first and only relief outing of season and professional career...Earned first win in next start, June 19 vs. Bradenton. Allowed one unearned run on one hit with a walk and four strikeouts over 5.0 innings...Allowed all 11 runs with Jupiter in first eight outings...Over final five appearances with Hammerheads, allowed just 15 hits and no runs over 27.0 innings to earn Marlins' Organizational Pitcher of the Month for July...Finished time at Jupiter with 5-2 record and 0.88 ERA (61.2/6) in 13 appearances (12 starts)...Promoted to Double-A Jacksonville on July 30 and made first start on August 1 at Chattanooga...Allowed three hits and no runs over 6.0 frames, running consecutive scoreless innings streak to 34.0...Touched for five runs and nine hits over 3.0 innings on Aug. 6 vs. Tennessee...Marked shortest start of season, and season-highs in hits and runs allowed...Tossed season-best 7.0 innings on August 23 at Montgomery, allowing just one run on five hits with two walks and five strikeouts...Went 4-1 with 2.94 ERA (33.2/11) in six starts with Suns...Participated in Arizona Fall League and went 2-1 with 1.95 ERA (27.2/6) in seven starts for Glendale. Earned Arizona Fall League Player of the Week honors in week five, going 1-0 with 1.80 ERA in two starts...Heads into 2014 as Marlins' top prospect as rated by Baseball America. Also, said to possess best slider in Marlins organization by same publication...Ranked as MLB.com's No. 1 left-handed prospect in Minors heading into season. March 28, 2019 Los Angeles Angels placed LHP Andrew Heaney on the 10-day injured list retroactive to March 25, 2019. Left elbow inflammation. April 13, 2018 Los Angeles Angels activated LHP Andrew Heaney from the 10-day injured list. April 6, 2018 Los Angeles Angels sent LHP Andrew Heaney on a rehab assignment to Inland Empire 66ers. March 29, 2018 Los Angeles Angels placed LHP Andrew Heaney on the 10-day disabled list retroactive to March 26, 2018. Left elbow inflammation. August 18, 2017 Los Angeles Angels activated LHP Andrew Heaney from the 60-day disabled list. August 1, 2017 Los Angeles Angels sent LHP Andrew Heaney on a rehab assignment to Salt Lake Bees. July 13, 2017 Los Angeles Angels sent LHP Andrew Heaney on a rehab assignment to AZL Angels. April 14, 2017 Los Angeles Angels transferred LHP Andrew Heaney from the 10-day disabled list to the 60-day disabled list. Left elbow UCL injury. April 1, 2017 Los Angeles Angels placed LHP Andrew Heaney on the 10-day disabled list retroactive to March 30, 2017. Left elbow UCL injury. November 7, 2016 Los Angeles Angels activated LHP Andrew Heaney from the 60-day disabled list. June 24, 2015 Los Angeles Angels recalled LHP Andrew Heaney from Salt Lake Bees. April 4, 2015 Los Angeles Angels optioned LHP Andrew Heaney to Salt Lake Bees. December 11, 2014 Los Angeles Angels traded 2B Howie Kendrick to Los Angeles Dodgers for LHP Andrew Heaney. September 2, 2014 Miami Marlins recalled LHP Andrew Heaney from New Orleans Zephyrs. July 6, 2014 Miami Marlins optioned LHP Andrew Heaney to New Orleans Zephyrs. June 16, 2014 Miami Marlins selected the contract of Andrew Heaney from New Orleans Zephyrs. May 20, 2014 LHP Andrew Heaney assigned to New Orleans Zephyrs from Jacksonville Suns. January 9, 2014 Miami Marlins invited non-roster LHP Andrew Heaney to spring training. July 30, 2013 LHP Andrew Heaney assigned to Jacksonville Suns from Jupiter Hammerheads. May 20, 2013 Andrew Heaney assigned to Jupiter Hammerheads from Greensboro Grasshoppers. January 28, 2013 Miami Marlins invited non-roster LHP Andrew Heaney to spring training. August 13, 2012 Andrew Heaney assigned to Greensboro Grasshoppers from GCL Marlins. July 16, 2012 Andrew Heaney assigned to GCL Marlins from Miami Marlins. July 13, 2012 Miami Marlins signed LHP Andrew Heaney.